A couple of summers ago, we visited Quebec City and stayed at L’Hotel Port-Royal in the lower town. I found the view of the street corner in front of the hotel endearing, especially a brick building with a curious mural that had been painted on the side of it. The mural said “Cigarettes Sweet,” or perhaps it meant “Sweet Cigarettes” (as it was probably an ad, the text may have been purposely reordered for effect). I tinkered with painting one of my photos of this corner for well over a year. It took a while for the image to unfold, both in my mind and on my drawing monitor, partly because I kept putting it away for periods of time and working on other things. When it finally started taking shape, I just wanted to have fun with it and that’s how “Canadian Wildlife” came to be. Mist on Birch Hill (above) has a back layer of purple patterns from a small strip of rubber I carved and then used as a stamp. After coating the carved rubber with dark purple ink, I pressed it over and over again onto white paper, forming a loose pattern. After making a pattern a little more than a foot wide, I photographed the design. I transferred this to the birch trees painting as the bottom layer and enlarged it. I created duplicate layers of it to piece together a larger pattern. In some sections duplicate layers were also used to intensify or thicken the pattern and in other areas to create an offset effect. The pink paint was applied in varying degrees of translucency to allow the pattern to show through. Mist on Birch Hill is the most recent image I’ve made. On first glance the finished print looks to be just two colors (unusual for me! ), pink and white. It actually has back layers of deep purple and peach, as well as top layers of pale blue on the shaded side of the trees. I was quite happy with how the final prints came out. It’s a forest made for a daydreaming stroll. The hospital was renovating its imaging floor and looking to bring in art referencing sites along the Freedom Trail. As such, each corridor would be named for a street with a Freedom Trail connection. My street assignment was State Street, and more specifically, the Old State House. I remember how appealing the look of the Old State House was to me when I first came to Boston 25 years ago. I especially liked the lion and unicorn statues on the upper front corners of the building, so unlike any buildings I’d known in my life in Miami. As I considered this project, I thought it’d be fun to play off the idea of tourists seeing those statues for the first time. But the tourists would be lions and unicorns, rather than humans, and pleased to see their own kind monumentalized. That’s not to say the lions and unicorns in the artwork weren’t humanized — they were. They were given human forms to a large degree, as well as clothing. I wanted to create a correlating equivalent to tourists one might see walking around Boston taking in the historical sights, so the scene would feel simultaneously normal and surprising. The project began with an afternoon walk from my South End studio down through Downtown Crossing to the Old State House, where I took hundreds of photos of the building from different angles. What I most wanted to get was a straight ahead view, and that was pretty tough due to the configuration of the street in front of it. The best head-on view could really only be obtained while standing in the middle of the street, which I did, very carefully. Dividing the artwork into two separate paintings, I began with the building itself. The building alone took me about two weeks to paint, mainly because of all the brickwork and mortar. My plan was to have a gathering of lions along the sidewalk nearest the lion statue, and unicorns gathered on the side with the unicorn. Then I added in one unicorn on the lion side, and one lion on the unicorn side for a little balance. To figure out how the pointing poses should look, I had a few friends pose for photos while they pointed up toward the sky. The surrounding buildings were purposely painted more loosely, highlighting the architectural detail of the Old State House as well as how deceptively tiny it can feel in their looming presence. This diptych was to be printed on plexiglas and wall mounted. I have to admit I was a little skeptical about the plexiglas, but when I saw it installed at the hospital I appreciated how luminous and sleek it appeared. Note: I’ve set the two images at the beginning of this post to show side by side, so that you can see the entire diptych image. If you’re looking at it on a mobile device, however, you won’t see them side by side. A 2014 Boston.com story about the refurbishment of the lion and unicorn statues. The Bostonian Society’s History of the Old State House. Hi there. I hope you’ve enjoyed the December holidays and look forward to a new year. In the past 2 weeks, I’ve had what might most positively be described as an unexpected break from routine. It began one evening when I was headed home from my studio, looking forward to a delicious dinner of stew-like chicken soup my partner Joe had made the night before. I had just completed the finishing touches on a Chanukah gift I planned to give a friend at a lunch date the next day. I live about an 8 minute walk from my studio, so as I left the building that crisp evening I knew I’d be home and enjoying dinner in no time. It was moments later that my feet hit ice, and in a flash I felt my body going down. After hitting the ground, I was stunned and afraid to move. There was nobody around that I could see right away. I remember reaching for my knee, and upon touching it, realizing that something was not right. In fact, it felt like there was a crater there. I’m naturally prone to queasiness, so I tried my hardest to keep my head together and not pass out. I decided not to move. My crossbody purse was still attached to me, and I managed to fish my phone out of it and call Joe. “I fell, and something’s wrong with my bones,” I said as calmly as possible when he answered the phone. He came immediately by car, and after touching my knee, said, “Okay, we’re calling an ambulance.” I tried elevating my mind to another level, to a place disconnected from my body. The next day I had surgery to repair a broken patella and a ruptured tendon retinaculum. I knew I had no choice but to have the surgery, but I was pretty scared. The surgeon’s optimism about repairing it only calmed me to a point, and afterwards, the pain nearly drove me out of my mind. A few days later, I was able to leave the hospital and come home. It was a week before I could get in and out of bed by myself, until the glorious moment when my wonderful in-home physical therapist crafted a helpful sling out of my bathrobe belt. That was a tough week. Over time the pain grew less intense, and today, 2 weeks after surgery, I had the 30 staples removed from my knee incision. Today I became aware of the word “break” floating through my mind. As in: a break in the bone, a break from normalcy, a break in the order of daily priorities, a break in exercise regime, a break in independence, a break in the flow of work and business. I also thought of how the word “break” can have good connotations, as in: break bread, break the silence, break new ground, and “I’m on a break,” or “Let’s break for a while.” I am indeed “on a break,” albeit not of my own choosing. I ponder whether in the midst of this break there are ways to keep my art-making and my business operating right now that I’m not seeing. I’m poking around inside my mind for creative ideas, for ways around my limitations without excessive complication. I want to believe that maybe there are ways, and if there are, that maybe I can recognize and implement them. I’m slated to be in this straight leg brace 4-6 weeks, followed by physical therapy to work on bending the knee again, with some adjustment in the brace to allow some movement at the knee. I’m told my leg’s eventual prognosis is probably pretty good. I’m happy about that. I’m using this time to read “Conversations with Tom Petty” by Paul Zollo on my Kindle. It’s been a joy to read, in Tom Petty’s own words, his thoughts and feelings about his creative process. For example, the art of recording songs in contrast to the art of performing songs live. Or the magic (and sometimes the grind) of how lyrics manifest, sometimes alone and sometimes in collaboration. His descriptions of how so many songs and albums came to be is definitely inspiring my own invitation to the muse, whom I’m pretty sure is always somewhere nearby waiting for an open channel. Right before my fall, I bought some orange coffee cups (pictured above). To me, the color orange is evocative of happiness, sweetness, motivation, and action. It’s such a silly little pleasure, but I savor drinking coffee with a spoonful of honey from one of the beautiful orange cups every morning. I often say that working on my paintings is color therapy for me, and for now these radiant orange cups provide me with a little of that feeling. So, what I’m apparently not taking a break from is connecting to beauty and inspiration. If anything can help get me through to a better place, that can. Thanks for reading, and I send you my heartiest “go for it!” for turning your dreams to reality in the new year. My latest project was creating two artworks for an aerospace consulting firm here in Boston. Fairmont Consulting Group had just moved into their new downtown office space. Their managing director Jay Wynn told me it was not unusual when visiting offices in his industry to see framed photographs on display. He wanted something more unique than that for their offices, though—he envisioned colorful images with artistic flair. He’d been to one of my First Friday studio events and saw my painted photographs of city streets and buildings, and that style appealed to him. He knew of a photograph of an F-35 jet taken at the 2017 Paris Air Show by Roelof-Jan Gort that he really liked, so he contacted him about licensing the photograph for me to paint. The photographer (thank you, Roelof-Jan!) was willing to do that. I had visited Fairmont’s new offices and saw there was a dominant color scheme already in place. There were accent walls of chocolate brown and other accent walls of an orangish-red (a cross between “brick red” and “tomato soup red”). The carpets were patterned in shades of dark brown and red. There was even a deep red tile wall in the kitchen. All around, the color mood was earthy and deep. That gave a definite structure to the painting process from the beginning. My challenge was to complement, not clash, with the environment! 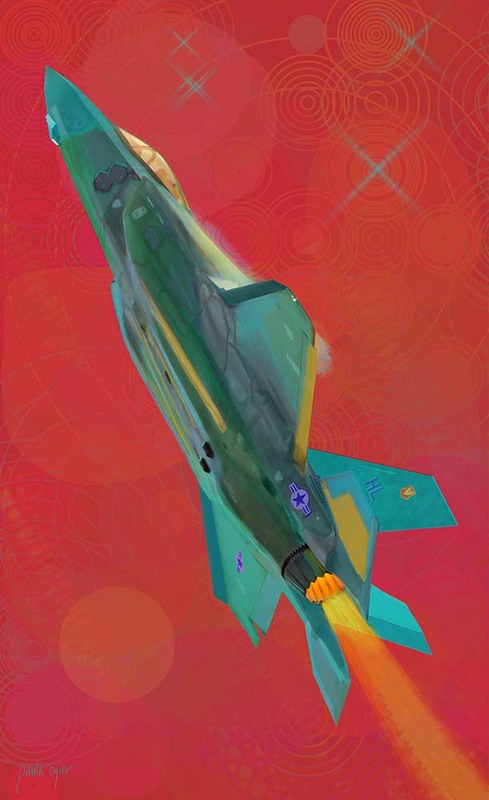 The first piece I made was “Afterburner,” above, which was vertically-oriented using the entire jet’s image in flight. I opted for a slightly retro and graphic look for the background. It will go on a narrow section of wall that juts out from the main wall. At our first meeting, we had discussed how to approach the second piece. I suggested zooming in on a section of the aircraft—an interesting angle or intersection. We agreed that not everyone would necessarily know what it was, but it would be recognizable to people in the industry. It was going to be in the same conference room with the vertical piece. Piece #2 had a wider section of wall, so it would be horizontally-oriented. For Piece #2 (above), I didn’t want to use all the same colors for the jet as in the first piece. I wanted it to stand on its own as a separate artwork, but for the colors in each artwork to speak to each other. The horizontal lines I used for the sky lent a graphic element, but initially they felt a little too clean and crisp, so over time I worked on softening them. My printer Mark Peterson ran some proof sections of the prints with me the week before we printed the pieces in their entirety. These were somewhat larger pieces than I usually work with, so that was very helpful in clarifying where color and lines might need adjusting. This project was a wonderful creative adventure. I was surprised how much fun I had working on it. 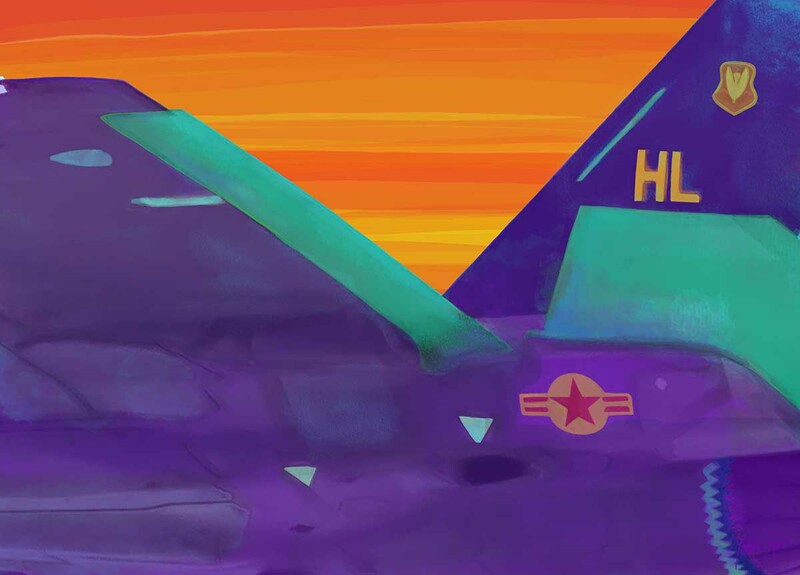 Except for one humorous illustration I’d painted a few years ago of a cat flying a glider plane, I’d never given much thought to painting aircraft! Just as I appreciate the structure and lines of buildings, I realized while working on these images how much I could appreciate the beauty of machinery.